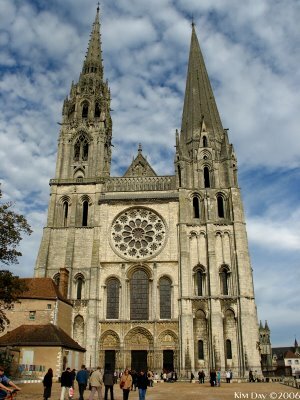 The Notre Dame Cathedral in Chartres holds a unique place among Gothic Cathedrals–it only took 66 years to build compared the hundreds of years that it took to build similar cathedrals like Notre Dame in Paris. 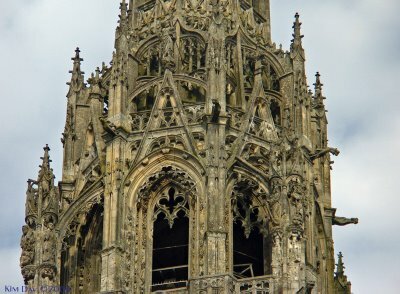 As a result, historians say it is the purest example of Gothic architecture in Europe. It has been repeated struck by lightening and portions rebuilt rapidly by those living in the surrounding town. Chartres Cathedral is filled with exquisite stained glass windows. 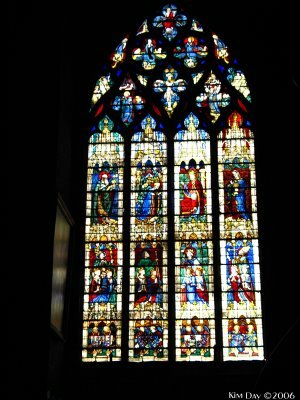 These stained glass windows survived bombings which destroyed much of the surrounding town in both World War I and World War II due to the fact that ALL of the stained glass windows were removed prior to the start of the war. Many of the windows are instantly recognizable by a particular color of blue, know as Chartres blue. 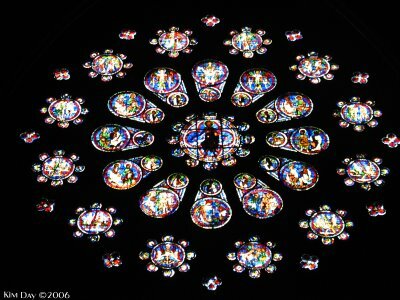 The Rose windows adorn the Cathedral on walls on the West, South and North to let in light at different times of the day. Primarily colored in reds and blue, each of the petal-shaped panes tell a different part of the Christian story. Many of the windows are so detailed that they are almost overwhelming. It’s impossible to take it all in in one viewing. My amusing story for the day–I was sitting in a cafe around the corner from my tour meet up location on the Rue de Rivoli. While I was eating an American couple came in and set down next to me (if their accents hadn’t been a dead give away, the white tennis shoes would have done the trick). While they were sitting there, I spoke a few very simple sentences in French to the waiter and then went back to reading my book, thinking none of it. After a bit, the woman got up to go the bathroom and I began speaking with her husband. As she came back to the table, there was a lull in our conversation and her first question after sitting down was “Are you English?” I must have looked a little startled because her husband quickly explained to her that I was from Pennsylvania (they were from Florida). I suddenly realized the woman hadn’t heard me speak a word of English, but had noticed that I was reading a book in English. Apparently, in her mind only someone who was not American would be speaking French. I guess my French pronunciation is better than I thought, because her next question was to ask me if I lived here. After being here for two days alone and hearing almost nothing but French, just hearing American English for a few hours is almost jarring. I’ve come to realize that Americans really are rather loud even if we don’t realize it. Often I find myself straining to understand the softly spoken French. The beautiful cadences of the language wash over me at times before I realize what exactly I’m hearing. Like live TV, I’m operating on a 10-second delay (and occasionally a little longer). But, day-by-day, I am understanding more. And maybe, if I’m lucky, by the time my cooking class rolls around next weekend, I’ll be able to understand my instructor well enough, not to cause a major international incident by burning the cooking school down. This entry was posted on Sunday, October 29th, 2006 at 3:10 AM. It is filed under Chartres, France, Travel and tagged with Cathedral, Chatres, Stained Glass Windows. You can follow any responses to this entry through the RSS 2.0 feed.